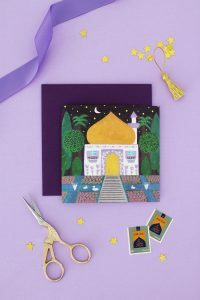 Ramadan Drummer Paper Bag Puppets – Hello Holy Days! Nearly every Muslim culture has some concept of Ramadan drummers (even if historically.) The job of the Ramadan drummer is to wake people up about an hour before dawn so people can take their pre-fasting meal. For North American children who might not be familiar with Ramadan drummers, we’re introducing them in a ficticious way. Small children too young to wake up before dawn can engage with the tradition of the pre-fasting meal through these paper bag puppets. Use our free printable template to make the puppets with your child, then have your child role play what kind of things the drummer might say to wake people up for their meal! On the top flap glue a rectangle piece of paper in any skin colour you prefer. On the underside of the flap, glue a rectangle piece of red felt. This will be the “open” mouth. On the rest of the paper bag, glue a rectangular piece of white paper. These will be the drummer’s clothes (shirt and baggy pants). Download and print out template. Cut out all pieces. *We’ve updated our template to a coloured template so you don’t have to trace each part onto coloured card stock as we had previously shown. Cut a small strip of yellow paper enough to fit between the vest. This will be the drummer’s belt. Trace the hair, moustache and beard onto brown felt (or use the paper template if desired.) Cut out and glue to puppet. On the hat that was cut earlier, attach a piece of embroidery thread by placing a small piece of clear tape at the back of the hat. Glue pom pom to the front of the hat, right at the end of the embroidery thread. Paste hat onto hair. Glue googly eyes and draw a nose with a black marker. You’re ready to role play with your drummer! TIP: Depending on age and ability of child, build the “base” of the puppet yourself and simply have child dress the puppet by gluing on pre-cut pieces. *A Ramadan drummer’s dress varies by culture; our Ramadan drummers are dressed in a costume inspired by drummers of the Ottoman Empire, when this tradition was particularly popular. Typically, Ramadan drummers are male, but this woman and these girls prove that females are just as capable of doing the job as men. Here is also a children’s Arabic storybook featuring a Palestinian girl who challenges gender stereotypes and takes over for her Ramadan drummer dad when he’s sick one day; last year, the book was translated into English – find it here (affiliate link).